The O-Ho is a Japanese tier 8 heavy tank. 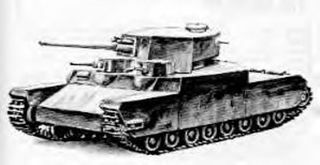 The O-Ho was a further development of the idea of a superheavy tank with improved armor protection. The vehicle had a good set of guns that allowed for all-angle fire. The project was discontinued due to the war ending. No finished prototypes were built and the vehicle never saw action. The O-Ho continues the Japanese superheavy line from O-Ni. The most noticeable improvement is significantly better rate of fire: both of O-Ho's guns has incredibly quick reload for their calibers. O-Ho also finally has improved side armor; while its still unimpressive, it makes sidescraping bit more reliable option. Furthermore, O-Ho's cheeks and miniturrets are no longer weaker than hull. Gaining significant advantages comes up with floppy downside which is extremely limited gun depression on front. One must learn to how to position O-Ho correctly in order to use it effectively. 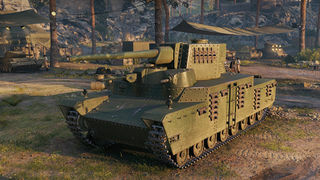 Furthermore, it still has same old downsides compared to its peers, such as poor mobility, gigantic size and flat armor that doesnt offer that much protection against higher tier vehicles. 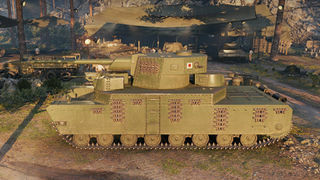 O-Ho can feel really akward at first and is arguably harder to play than other Japanese super-heavy tanks, but after one knows how to work around the limited gun depression on front, it can be very rewarding. The O-Ho leads to the Type 4 Heavy. - The 15 cm derp gun and top 10cm gun have very fast reload for their calibers; the derp gun reloads 9 sec faster than O-I! - Both guns have below average accuracy and aim time. - Ammo rack is large and easily damaged. O-Ho is natural evolution of O-Ni, with some major improvements. Armor is all around tougher, miniturrets and cheeks are now tough as front itself, and health is increased. Most notably, both guns have significantly quicker reload than similar guns on O-Ni. You have two gun options: the 10cm and 15cm. The 10cm gun has above average DPM, making it very effective when top tier. Penetration is average at tier 8 considering the top gun, at 215. This is great at top tier matches, but might come back to bite you at higher tiers, where premium shells might have to be utilized to compensate for the pen of standard rounds. Among with that, the 10cm gun has horrendous aim time and accuracy, with gun handling being only marginally better than that of the 15cm derp, other than the accuracy which is still better. Also the 10cm has 2 extra degrees of gun depression than the 15cm above the miniturrets, which makes the gun depression slightly less wonky, though -3 is still utterly abysmal considering the extremely high gun placement. The derp gun gives O-Ho unique play style as bulky support tank. The derp has significantly better stats than O-I and O-Ni, and on top of that, can mount VStabs unlike either of them. The derp gun actually has pretty good gun handling, which allows O-Ho to snapshot effectively. The raw accuracy is still very low, however. With right skills and equipment, the reload can be decreased to 13.5 seconds. The 150mm can hurt even tier 10 heavies, if shots are aimed carefully. O-Ho's extreme height and gun location allows it to hit most roofs or engine decks of tanks, doing nice damage. One of the most major issues of O-Ho is gun depression on front. Face hugging can be tricky, but with some practice by angling the tank just right amount, it's still possible. The mini-turrets are located more on left than right, so it is recommended to fight always on your right side if possible. Most of modules are shared with O-Ni. Mount derp gun and engine instantly. Neither of them requires tracks to be mounted. Then Research 10 cm expirimental gun. You can go ahead to Type 4 without researching tracks. But, If you want to equipping some equipment for this tank, Tracks is necessary. You can use either 15cm or 10cm by your own preference. N/A - the O-Ho never existed. The 120 ton O-I supposedly mounted a 105 mm gun on it's main turret, had two turrets in front and one in back, and up to 200 mm thick armor. However, with more information now available to public, it is known that all of this is false, and that there is only one version of the O-I - the 150 tonne O-I with 15 cm howitzer (with prototype being "only" 97 tons, as it lacked turrets, main armament and additional 75 mm armor). The 100 ton O-I is based on misleading information of the O-I combined with it's design being based on very early sketch of the O-I. It is however interesting to note how the information of the O-I 120t was came up. It has been mentioned on multiple ocassions that it was supposedly "shipped to Manchuria in 1944" an "had 200 mm armor" - neither of these fitting the description of the O-I. It is possible that it is actually misleading information based on the Type 4/5 super-heavy tank - whose turret was actually used at Manchuria in 1945 (mounted on a bunker), combined together with the information of the O-I. The drawing of "O-I 120", which is results of misconceptions. Note that the tank never existed. 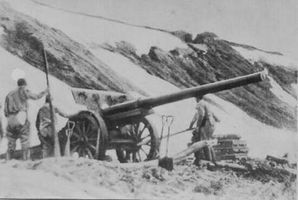 The Type 92 105mm cannon. The 10cm experimental tank gun. 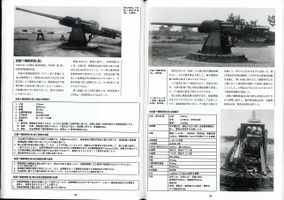 * O-Ho is based on the drawings from the book “Imperial Japanese Army Ground Weapon Guide 1872-1945”. 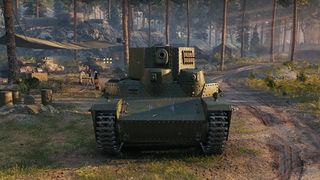 Unlike the drawings of "O-I 100t", which is what the tier 7 Japanese heavy tank O-Ni is based on, the dawings of the "O-I 120t" has basically no basis on them; they are *purely* based on false information and rumors. Due to this, the O-I 120t/O-Ho never actually existed. In-game name is incorrect. The name "O-Ho" means "fifth (super) heavy tank". There however are no third and fourth super-heavy designs, as the O-I was the first and the Type 4/5 (O-Ro/O-Ro Kai) second design. If the O-Ho actually existed, a more realistic designation would be "O-I III" (as the both O-I 100t (O-Ni) and O-I 120t are based on designs that were earlier designs than the O-Ro, they most likely would have been referred as "altnerate" designs to the O-I - O-I 100t and O-I 120t as O-I II and O-I III, respectively). This page was last modified on 30 September 2018, at 21:28.